Dr. William Kearns was an invited Keynote Speaker October 27th for the Jockey Club Smart Ageing Hub Opening Ceremony & Symposium at the Hong Kong Polytechnic University. Supported by the Social Welfare Department of the Hong Kong SAR Government, the Department of Biomedical Engineering of PolyU has been making great efforts to tackle the challenge of an ageing population in Hong Kong. Dr. Kearns' presentation, The Promise of Gerontechnology, discussed how technology and environmental enhancements can allow independence and aging in place by delaying transition to expensive long-term care. 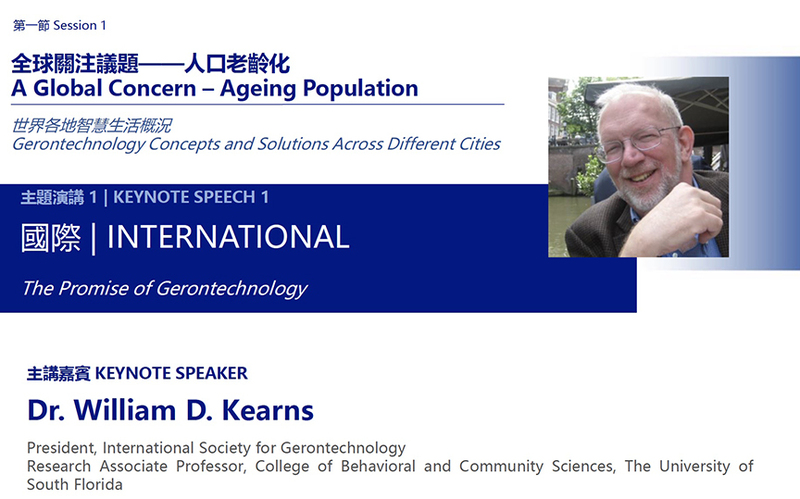 As President of the International Society for Gerontechnology (ISG), Dr. Kearns also discussed ISG's goals and missions and described its role in worldwide research and educational efforts to provide improved care for older adults. Dr. Kearns is also an invited main panelist at the International Gerontechnology EXPO & Forum November 8-10, 2018 in KINTEX, Illsan, South Korea.